Over 50 Years in Business • Since 1965 • Open 7 Days A Week! We are committed to maintaining highly ethical and sound business practices in order to meet and exceed our customer's automotive needs. Stan is the Man! That say's it all. He works with your budget and he totally hooks it up. I always shop around for the best deal and I always end up back at Stan's. You don't need to go anywhere else his prices are the best! As a single mom money is everything I've been going to Stan's for over 4 years now drive from Ventura,CA best price great tires. Honest and makes sure me & my boys are safe. Thank you so much!!! Just now I said I had a flat tire and he said he'd sell the used tires to me for only 30 bucks. im so relieved. very friendly service. the other tire places i called nearby weren't anywhere as polite and professional as Stan. thank you for the help!!!!! My front two tires were worn out, I was a little low on funds at the time so Stan hooked me up for two very good used tires for $60. The service was fast and friendly. Stan was very humble and he honored his word. I'm going back there for some new tires soon. ITS A ONE STOP SHOP!!! VERY ACCOMMODATING...AND THE MOST IMPORTANT IS YOU ARE TALKING TO THE OWNER HIMSELF. HE IS THE SUPER LOWEST PRICE COMPARE TO OTHERS AND OPEN ON SUNDAY.THANK YOU VERY MUCH STAN FOR GIVING ME A GOOD SERVICE!!! I first met Stan The Man in 1976-77 in my magazine work at Popular Hot Rodding magazine. I was 32. Today I'm 71. I utilize Stan for everything automotive because he is honest and his crew know their mechanicals. For wheels and / or tires, I don't even ask price because I know he tries to give great deals. And he has since for me since 1976. Thanks Stan The Man.! Stan is the only place I will buy tires He has taken care of all of my cars. Even my daughters little Festiva with 12" tires...You will not find a better place to buy tires than at Stan's..He is the man! - I live in Simi and will drive to Van Nuys to see Stan and Stan only..I also work for Fred's Hot Rod Shop in Simi and Fred buys all his tires for all of his projects and clients cars there... AWESOME PLACE! Stan , This place is one stop for all your needs Jose and the staff are awesome very pleased they are hard working and honest. Starving college student on my way home to long beach state. My tire loss air due to the cracked sidewalls. Stan was the only place open on an early Sunday evening. Installed my temporary spare and drove 10 miles to Stans. Needed to replace two badly cracked front tires with two good used tires to remain in my budget. Stan realized that new tires were going to be safer offered me a great deal on two new tires. After safety checking my rear tires, he offered me an even better deal on 4 new tires. I did not have the cash available to complete the transaction. Stan made a verbal arrangement we me in which I was able to drive home in 4 new tires. I was thank full for Stan lending me a helping hand. Excellent service, great person. Stan displayed trust and integrity. Hard to find great customer service in a "make a quick Buck world". Stan is the man. I have bought 5 sets of 4 tires for my vehicles with Stan over the past couple years!! The service and prices are the best, as I drive all the way from Malibu, I have checked, nobody beets their prices!! What can I say...Tires by Stan was the last place I stopped at after looking for tires for about 2 hours. Stan's worker showed me quite a few tires that looked exceptionally good for being used. Stan came over, spoke with us and was very kind and funny. He gave us an incredible price on four used tires and gave us a guarantee, who does that on used tires? Stan made our visit very pleasant and was even joking and playing with my 3 year old son. Stan made the tire shopping and buying experience one of a kind. With the prices he gave us and the customer service from him and his employees, we will definitely return and recommend Tires by Stan to anybody that is looking for a great price on tires and get excellent customer service at no extra charge. Thank you Stan for the great service and making our time at your shop pleasurable. I was at the dealership getting my oil changed and the service tech said I needed new tires... He was going to charge $360.00 for a set of 2 wheels. So I started looking for a tire shop and ran across Tires by Stan. And he gave me a super deal for 2 new tires and for a alignment and it was a quick service. I recommend this place for everyone. Especially if you don't have dealership money to spend or want to save $$$ and get your kids extra gifts. Fast and reasonable. Always find you a good deal. Owner cares very much about your satisfaction. Saved me money on my Ford edge and patched a tire chain retailers did couldn't be done. Only shop I go to. Great place to buy tires. prices are great, people are friendly, and you support a local small business. I recommend tires by stan for everyone. This tire shop is awesome... The customer service is amazing and their prices are the bomb. If you're looking for service with a smile, this is the place! I went in wanting to rotate my tires on my old 86 Buick and during the rotation they noticed my tire was feathered and had a bad bubble it was plain to see. I said it's okay and was going to drive 800 miles on that tire to get home for Christmas. Stan over heard and jumped right in! He gave me an offer I could not refuse! All four new tires for such a deal! "Merry Christmas" he said! I am so grateful for Stan not only possibly saving my life from driving on a bad tire but saving me a bundle so I can afford to see my family as well! This is the second time I have came to Stanford tires and I will ALWAYS come back here. If anyone needs an alignment or new tires or even a rotation, come to Stan cause he's the man!!!! My mom and I were driving down Roscoe approaching Woodley when we went over a pot hole and both of our right side tires went flat. (This happened to three other cars today as well.) We were panicked but fortunately our car had "run flats" so we could make it a mile or so to the closest and highest rating tire place. So happy that we came here because they were fast and well priced! Come here if you need new or used tires. They have the best deals in the valley. Tires by Stan is the best!!! It's hard to trust anyone but luckily I heard about this place from a friend. I checked the place out and I couldn't be any happier with my service. Fair prices and fast service!! Jose and Stan are real Stand up guys with integrity. Today was my first time dealing with Tires by Stan and my experience was great. Nice and clean facility. I'll definitely be a repeat customer. I went in wanting to rotate my tires on my old 86 Buick and during the rotation they noticed my tire was feathered and had a bad bubble it was plain to see. I said it's okay and was going to drive 800 miles on that tire to get home for Christmas. Stan over heard and jumped right in! He gave me an offer I could not refuse! All four new tires for such a deal! "Merry Christmas" he said! I am so grateful for Stan not only possibly saving my life from driving on a bad tire but saving me a bundle so I can afford to see my family as well! This is the second time I have came to Stanford tires and I will ALWAYS come back here. If anyone needs an alignment or new tires or even a rotation, come to Stan cause he's the man!!! Great customer service, great prices, excellent combination. I highly recommend. Thanks for your help gentlemen. I was on my was to another national tire store but I decided to call stan's tires just to see if they had my tire size and brand. talk to the manager their but I forgot his name and said he had the size and brand I was looking for boy was I stoked I rushed down their and they had the tire I was looking for but way cheaper than the other store. Man im glad I called stans the manager hooked me up and even gave me a trade in deal for my existing tires that I didn't like. I highly recommend this place if your trying to save some cash! It was a Sunday, my only day off. My car had a blowout a week ago, and I was driving on a spare that hole time. 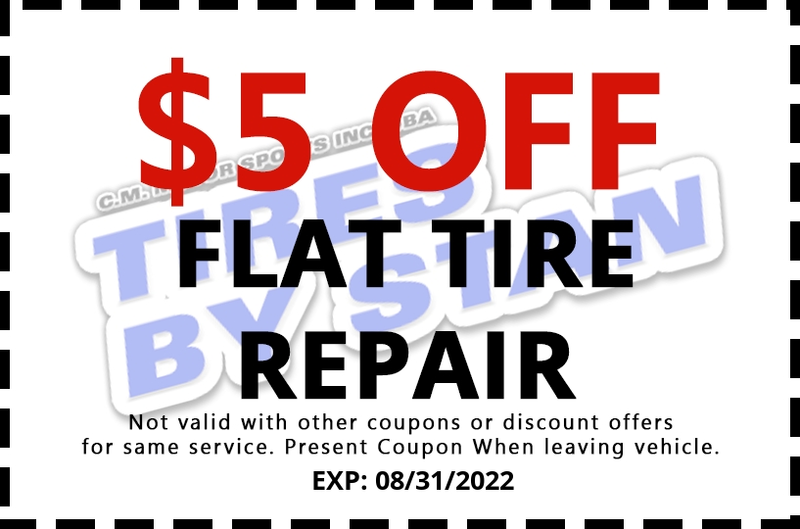 Being on a tight budget, with only Sunday to spare, the only shop that was able to help me out was Tires by Stan. Stan gave me an unbeatable deal on two used, but great quality tires, had them installed and even did an alignment on the car. I spent less than expected, and Stan was an absolute pleasure to do business with. I drove 15 to get there, but would not go to any other shop from now on. I would highly recommend Tires by Stan to everyone I know. They are the best, providing fast, reliable service at very reasonable prices. In and out in 20 minutes! Got a fantastic deal on a used tire! Friendly staff and I'm not sure who other reviewers talked to, since I had no problem speaking English with them. Thanks Stan! "The Last 7 Years!" - I want your business!